Hooray on deciding to learn to hula hoop. Hooping has been the most rewarding activity for me and i have really enjoyed the benefits of hula hooping immensely. Along the way you will switch from beginner dance hula hoops through to poly pro hoops. Each hula hoop may feel different and you may feel more comfortable using a specific hoop for a specific trick or hula hoop dance move. It’s best that before ordering you pick a hoop size based on your ability. See Hula hoop profile and your body size below. We make hula hoops for adults and kids for sale all made in NSW, Sydney’s Northern Beaches, Australia. A simple fact that will take you far If you are interested in a good workout, keep in mind that the lighter in weight the hoop is, the more calories you will burn, because you will need to work harder to keep the hoop up in revolution. Mini Hula Hoops: My Mini Hula Hoops Packs consist of 2x 76cm hoops, 20mm thick and weigh 150 grams. Mini size is suitable for kids under 6 yrs of age. New to Hula Hooping / Hula Hoop Dance? If you are new to hula hooping it is preferable to start off with a 95cm Dance Hula Hoop, however if you are experiencing extreme difficulty in keeping the hoop in orbit you are best to start off with the 100cm fitness hula hoop, the larger the diameter . The more that you practice, the better you will get at it, each time. The rule is: Lighter and smaller the hoop = lighter and faster. Thicker and/or larger = heavier and slower. Ready to move into more advanced Hula Hooping? 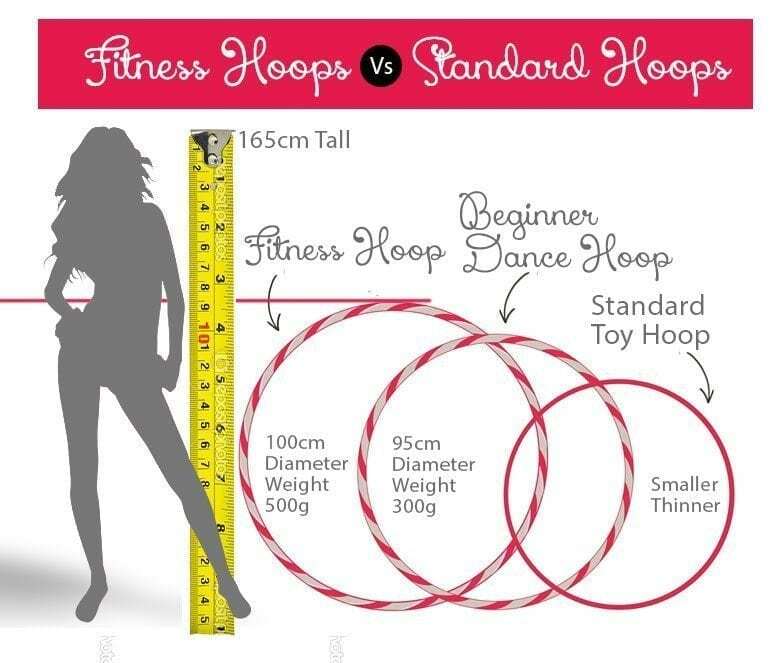 Once you become more experienced and have mastered keeping your hula hoop up in orbit around your waist and hips with ease and control, its time to upgrade to a medium size hoop which is ideal for learning off-body hooping techniques. Off-body hooping is the practice of manipulating the hoop with your hands, arms, and elbows, lifting it off your body in circular momentum. Review the hoop profile and body size information below. Never hooped before? Don’t panic, It really is simple, just keep reading, it will only take a few minutes to learn to speak our language. Now that you’ve determined what hula hoop profile you are and what hoop size you’ll need, its time to choose your new hula hoop, and start having loads of fun by hooping into health and well being!